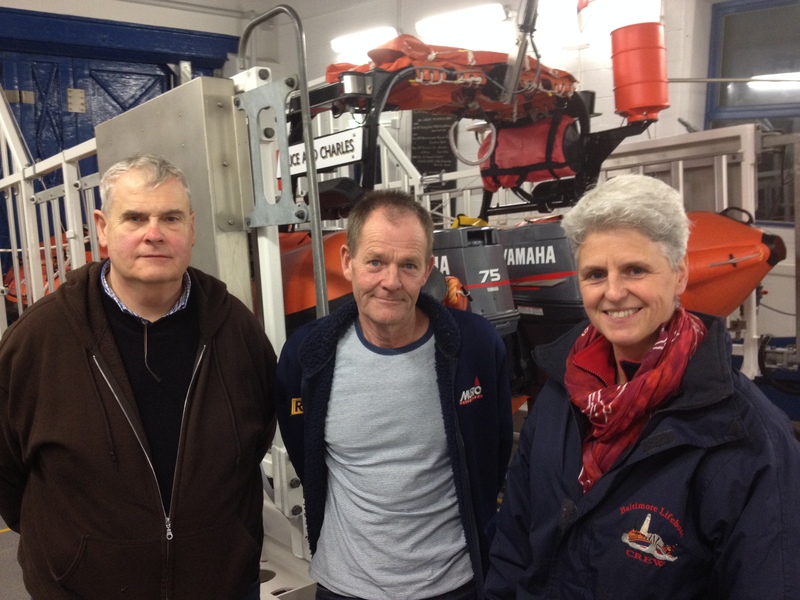 Baltimore lifeboat station has gone through a huge period of growth and development over the past ten years. 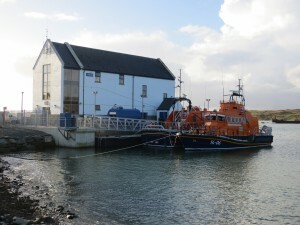 During that time we have seen an inshore Atlantic 75 lifeboat co-located with a new Tamar class all weather lifeboat. The station house itself has undergone massive change; a new berth and cradle mean that crew can step aboard lifeboats from dry land. The number of volunteers at the station has risen dramatically during this period to. We now have fifty-five volunteers, including lifeboat crew, shore crew and the Sea Safety team, alongside the very important fund-raising and administrative / maintenance functions that are necessary to run a busy station. Most recently two volunteers, Gerald O’Brien and Rianne Smith, have taken on the role of Deputy Launching Authority (DLA) joining Vincent Roantree who was appointed four years ago. 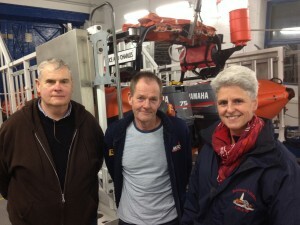 Their role is to support the Lifeboat Operations Manager (LOM), Tom Bushe. The DLAs play an important role in the chain of command for launching the lifeboats whether it be for a rescue or an exercise. The protocols for responding to an emergency at sea are well defined. 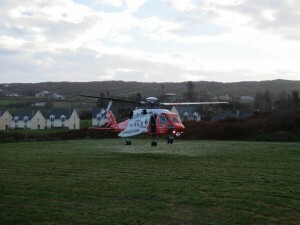 A 999 call to emergency services is diverted to the Coast Guard. The Coast Guard have an overview of all available rescue assets in an area, which could be RNLI, Coast Guard Units or Community Rescue Services. They will be aware when for example a Search and Rescue (SAR) resource has been taken off service for essential maintenance or if it is already tasked elsewhere. The Coast Guard can set off ILB and ALB crew pagers remotely. This is when they contact the DLA requesting the launch of RNLI lifeboats. The all weather lifeboat is equipped to go to sea in all weather conditions, while the ILB has a more limited range of conditions in which it is safe to launch. This does not happen very often. The DLA takes the names of all crew who have boarded the lifeboat going on service as a safety measure. When exercises are planned the Helm or Coxswain submit an exercise planning form containing names of crew, the area in which the exercise is taking place, the estimated time of departure and arrival back at the station. When the exercise has been completed the DLA is notified of the safe return of all crew. In this way the DLAs manage the safe operation of lifeboats and crew. There are lessons here for all those involved in managing maritime activities whether they be leisure or otherwise. We ask people to always be safety conscious and as we approach the New Year we urge everyone to let us know when and where fireworks/flares or Chinese lanterns might be lit, as they are frequently the cause of false alarms. While we have a large complement of volunteers at the station, we are still looking for anyone who might be interested in doing video editing of material recorded on lifeboat cameras. Please contact Tom Bushe in this regard. On a sad note, this year saw the passing of a long-serving RNLI local branch Treasurer and former DLA, Pat Fehilly. He is a great loss to his wife Maria, family, friends and the wider community and we in Baltimore Lifeboat will remember him fondly. LOM Tom Bushe remarked “since 1999 Pat served as a volunteer at the station in a number of different roles, throughout this time he was a gentlemen in every sense of the word. We extend our sincerest sympathies to his wife Maria and family”. 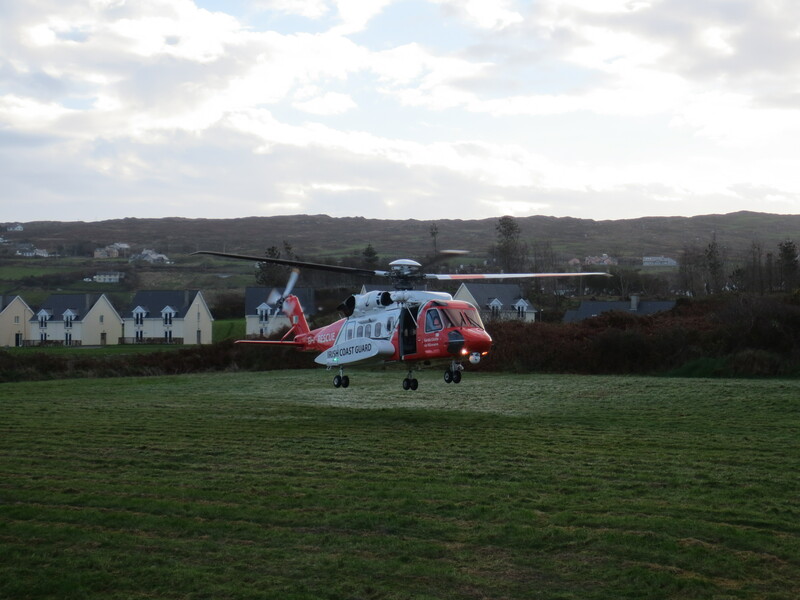 Shannon based Rescue 115 visited the field adjacent to Baltimore Lifeboat Station on Saturday 22nd November to test it out as a landing field for casualty evacuation. Following the construction of the ALB berth, the rock spoil extracted was spread over the old field. It was reseeded at the beginning of the summer to create a level area and the helicopter crew commented on the excellent location and suitability. 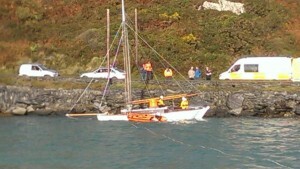 The all weather lfeboat Alan Massey was tasked to go the assistance of a 25ft timber sailing vessel today, Sunday 19th October when a sailing yacht broke her moorings and drifted onto rocks in Crookhaven harbour. The lifeboat was launched at 13:18 in high winds and a 4 metre swell and proceeded across Roaring Water Bay arriving onscene at 14:02. Coxswain Kieran Cotter directed launch of a small tender, called a Y boat, to go alongside the stricken vessel to carry out an assessment. Crewmen, Ger Sheehy and Tadhg Collins skilfully manouevred the Y boat into position in high winds (force 6-7) placing a pump on board. A beautiful sunny Autumn afternoon brought jeopardy for 2 men who had set out fishing. They had been drifting on a 30 ft motor boat off Yokane Point, West of the Stags. When they went to restart the engine it became apparent that a fault had occurred. They called for assistance having established that there was a problem with the filters. The RNLI lifeboat launched at 16:45 within minutes of the alert and arrived at the drifting vessel at 17:10. Coxswain Aidan Bushe went alongside the fishing boat, crewman Kieran Collins established a tow at 17:15. 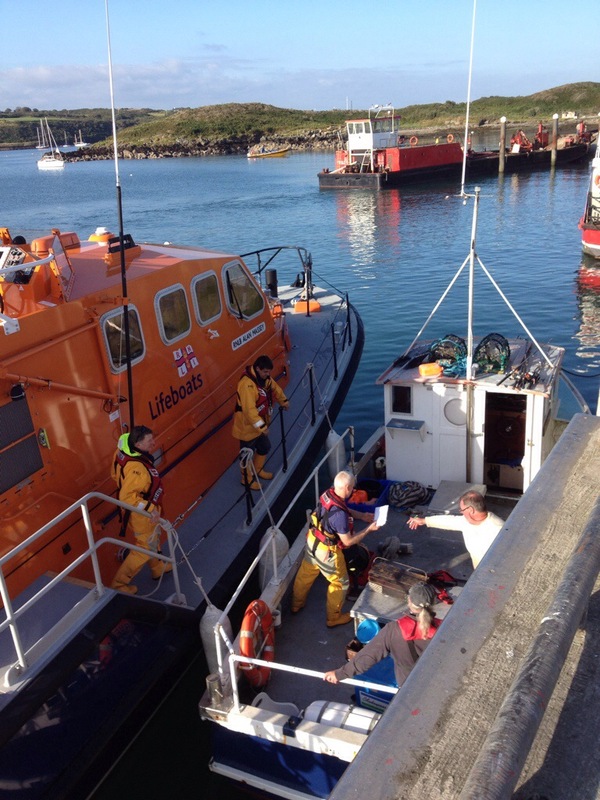 The lifeboat towed the fishing boat to safety arriving Baltimore Harbour 17:50. The motorboat was secured to the pier at 18.05. The lifeboat returned to the station at 18.20 and was ready for service again at 19.00 after essential cleaning and maintenance. On board were Coxswain Aidan Bushe, mechanic Cathal Cottrell, Brian McSweeney, Sean McCarthy, Kieran Collins, Micheál Cottrell and RNLI staffer Johnny Clooney.